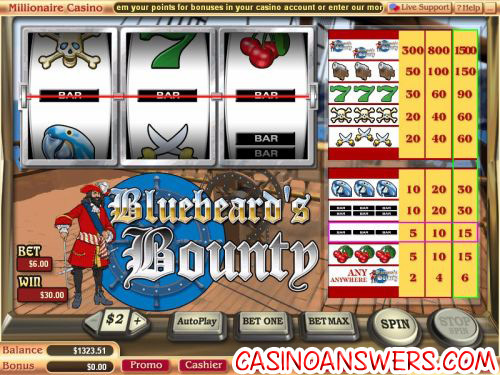 Bluebeard’s Bounty Classic Slot Guide & Review - Casino Answers! Bluebeard’s Bounty is a 3-reel, 1-line classic slot machine from Vegas Tech. You can play Bluebeard’s Bounty at the US-friendly Millionaire Casino. Bluebeard’s Bounty is very easy to play. Before you start, you must first select your coin size between $2, $5, $10 or $25. Then, you can bet between 1-3 coins per spin. That means that the lowest total bet you can make on Bluebeard’s Bounty is $2 and the highest is $75, quite high for a classic slot machine and ideal for high rollers. When you’re ready to play the Bluebeard’s Bounty slot machine, hit either “Bet Max” for 3-coins or just use the “Spin” button. During a spin, you can use the “Stop Spin” button to skill stop in mid-spin. The top jackpot on the Bluebeard’s Bounty is hit when you get three Bluebeard’s Bounty symbols on the center payline. If you get this winning combination, you will win 1500 coins on a 3-coin maximum bet. The more coins you play on Bluebeard’s Bounty, the more valuable this symbol becomes. There are 10 winning combinations on Bluebeard’s Bounty. Payouts on the Bluebeard’s Bounty slot machine are as follows (1/2/3 coin payouts in parenthesis): any Bluebeard’s Bounty symbol anywhere on the reels (2/4/6), 3 Cherry symbols or 3 Single Bar symbols (5/10/15), 3 Double Bar symbols or 3 Parrot symbols (10/20/30), 3 Double Swords symbols or 3 Skull & Crossbones symbols (20/40/60), 3 Seven symbols (30/60/90), 3 Cannon symbols (50/100/150) and 3 Bluebeard’s Bounty symbols (300/800/1500). Bluebeard’s Bounty has an autoplay feature. In it, you can set your spin settings: number of spins (5, 10, 25, 50, 100, 250 or 500) and number of seconds between spins (0, 0.25, 0.50, 1, 1.50 or 2). The stop settings are: stop once all spins are complete, stop whe jackpot is won, stop if a win exceeds or equals ($50, $100, $150, $200 or $250), stop on any win, stop if credits are increased by ($50, $100, $150, $200 or $250) or stop if credits are decreased by ($50, $100, $150, $200 or $250). You may cancel autoplay at any time. Likely due to its high betting range in comparison to most other classic slot machines, Bluebeard’s Bounty cannot be found at every Vegas Tech online casino. However, you will be able to find Bluebeard’s Bounty at the excellent Millionaire Casino. Are USA players able to play the Bluebeard’s Bounty slot machine? Yes, players based in the United States of America are able to play Bluebeard’s Bounty at Millionaire Casino and take advantage of their $5,000 signup bonus. For more details on Millionaire Casino, please read our Millionaire Casino Review. What pirate slot machines are there? Bounty slots?